Leaving was joyless, like when nothing is wrong but the mere absence becomes detrimental. The thought of reintegrating into the crowds, the sunshineless subway commute and calculated exchanges with konbini clerks: Tokyo was a vapid beast after three days in Oita Prefecture. 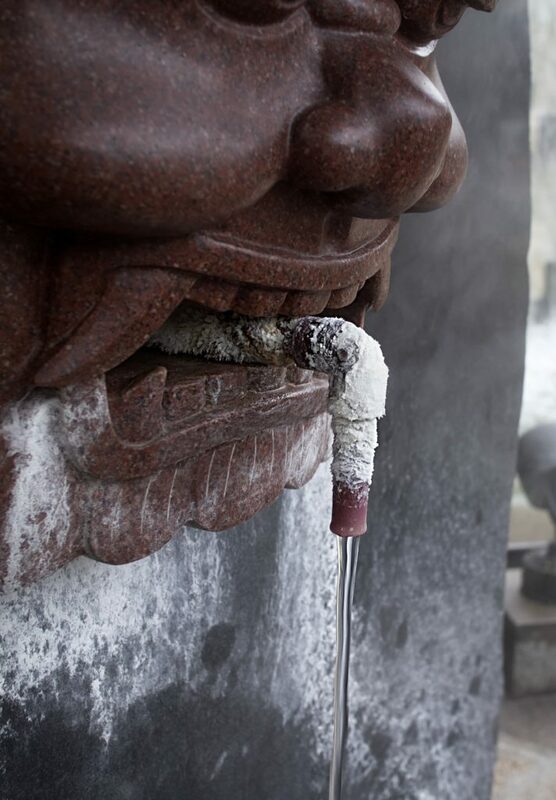 The sensation of temples with 900-year-old Buddhas, sipping (yes, sipping!) and soaking in the purest of onsen (hot springs), foods steamed in the same boiling pools and the people whose faces seem sore from genuine smiles: In Oita, joy isn’t too much to ask. 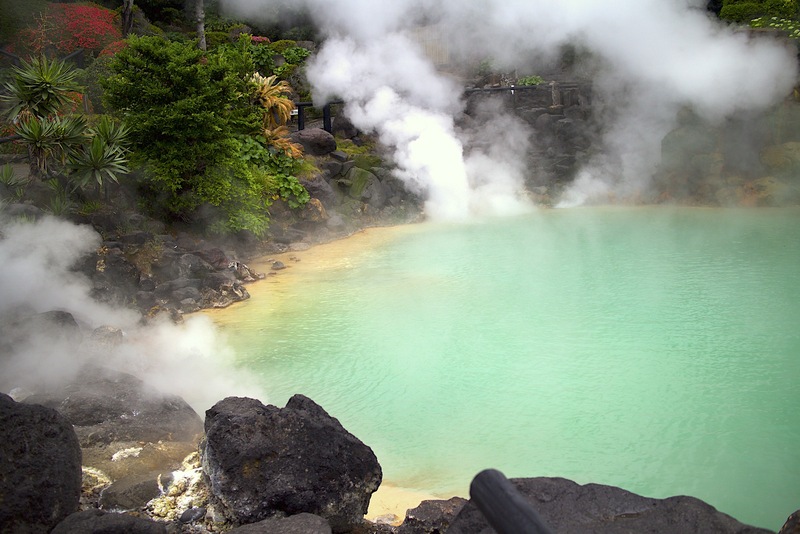 In the Hells of Beppu, you'll find amazing sights like this onsen. Oita Oita Oita, onsen onsen onsen. 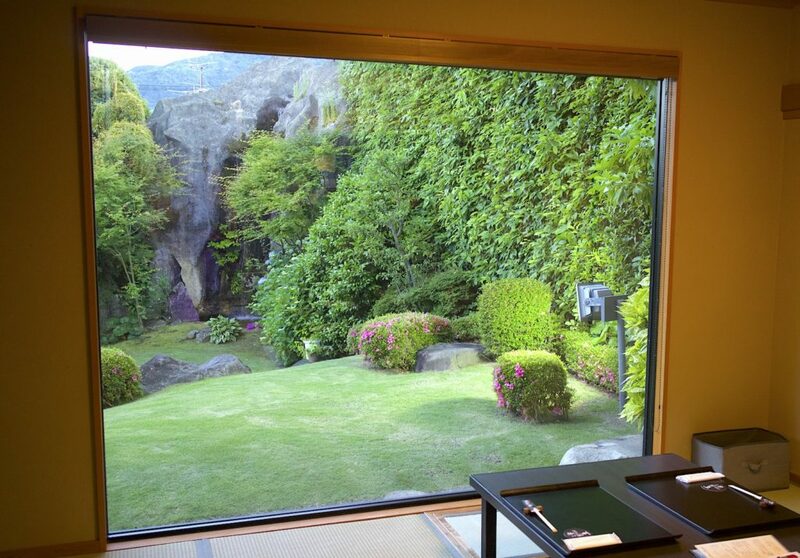 This tiny prefecture in Kyushu not too far from Fukuoka is said to be the onsen capital of Japan. I had been previously fascinated by Beppu, its second most populated city, and that fascination proved worthy. 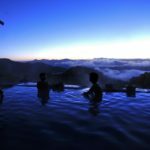 The typical reason travelers hop out here is to hop into the prefecture’s countless hot springs, supplied by the highest amount of wells (more than 2,200) in Japan also pumping out the largest volume of thermally heated water in the country (in liters per minute) and second largest in the world. 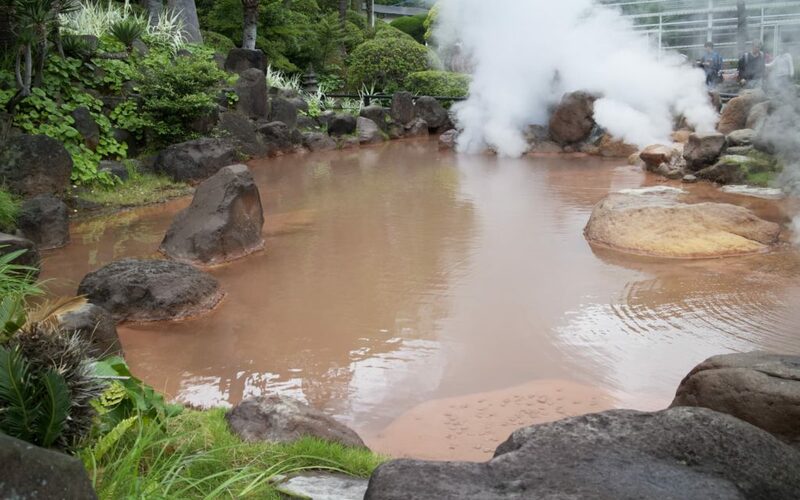 Beppu even hosted the World Onsen Summit at the end of May 2018, putting the city on the map internationally. 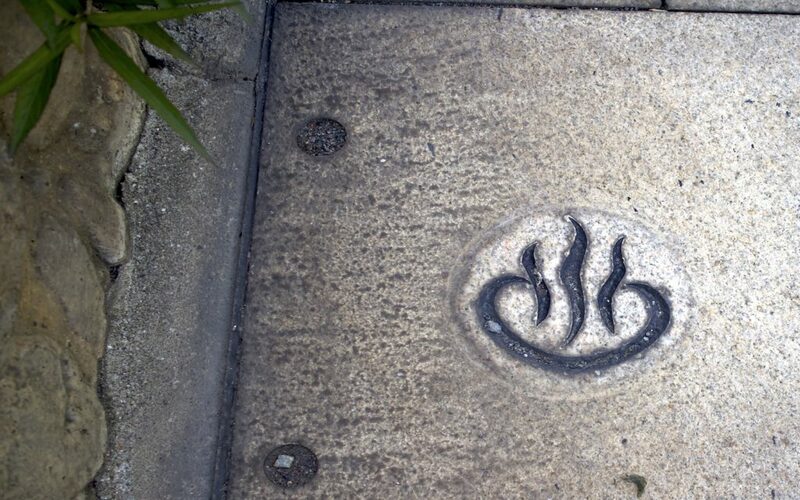 Even the streets are imprinted with onsen in Oita. 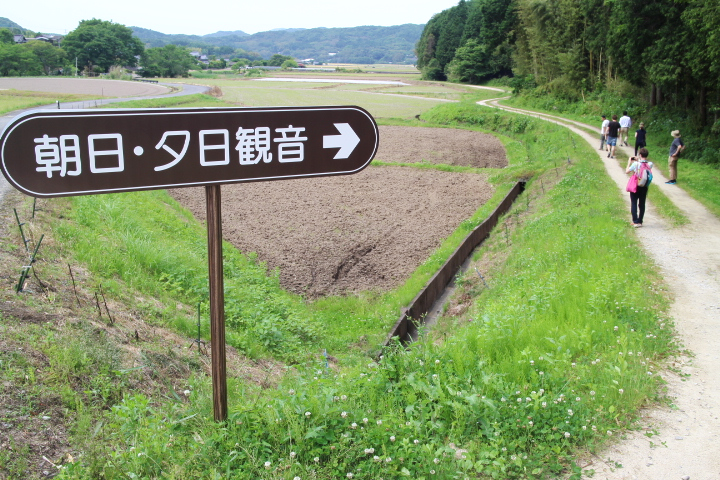 As a very rural area, Oita is currently putting in real efforts that are making a difference to draw foreigners and — more importantly — to give them the right info to get there. So in order to entice you to pack your bags and head there on your next Japan adventure, I am sharing my top photos from my trip that encompasses what Oita — for me — is all about, though it’s just a three-day slice. 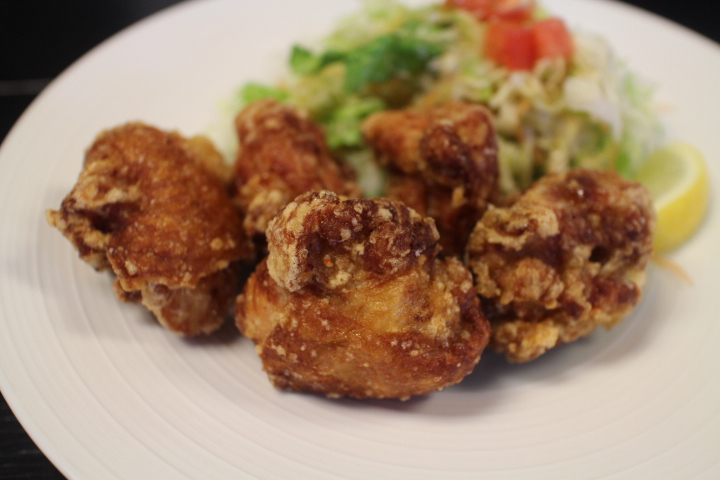 Karaage is a fancy feast here. 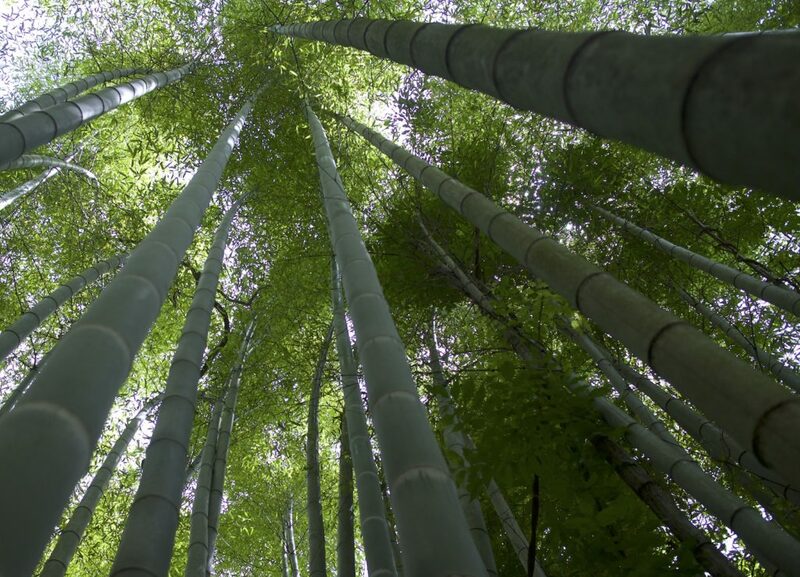 People traveling to Japan have an undying love of bamboo groves, and I stand by this unofficial-but-very-official theory. The sad part is that people think the only way to get this view is in the now so-famous-it’s-getting-defaced Arashiyama bamboo forest in Kyoto. 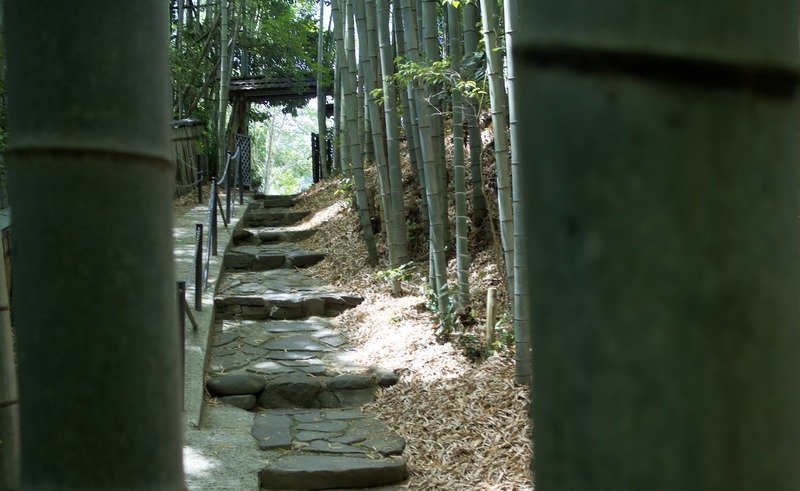 In fact, the bamboo entrance shown below in Oita’s Hita City holds a tea house and restaurant called Ohara Chaya. It was a much more memorable, not to mention peaceful, experience than in Kyoto. I (proudly) use a 2014 iPhone and a 2009 iPod classic, but this bike wins for oldest infrastructure on the premises of Maruhara (map). 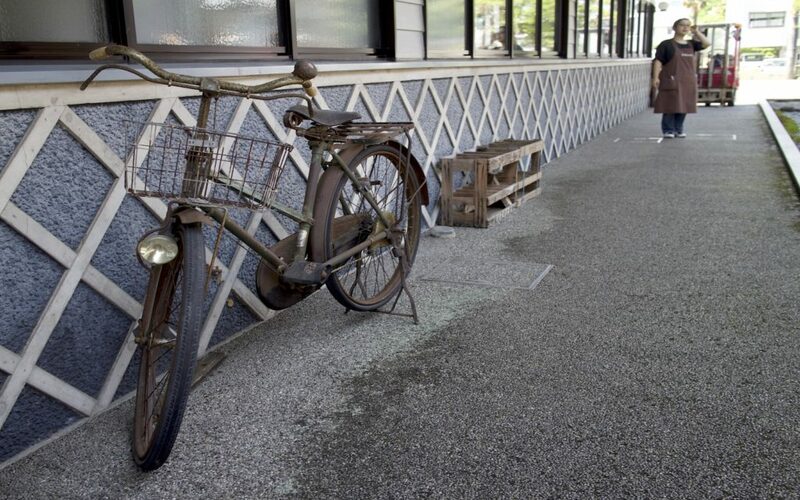 They keep this rusty, approximately 50-year-old bicycle on display at the soy sauce factory as a reminder of the good ol’ days when they would deliver their products by bike! They now export products to New York and Italy to fine dining restaurants (but not by bike)! While in this onsen haven, one does not simply bathe. One embraces the spring water in food and drink, too. 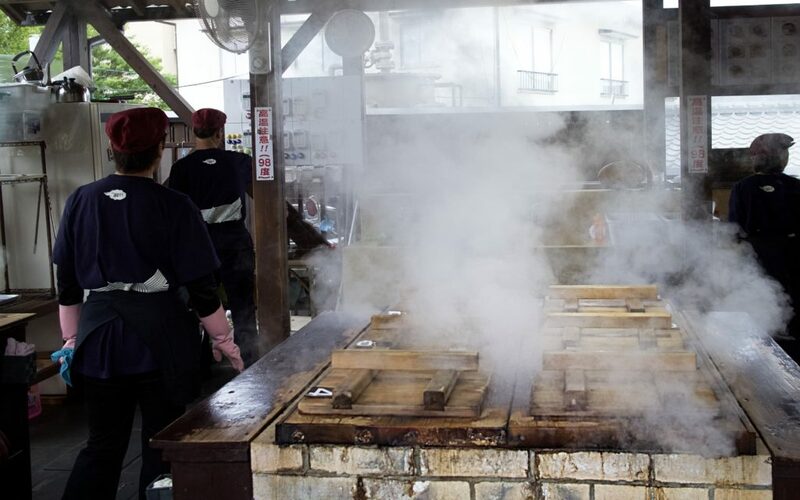 From the boiled onsen tamago (egg) to prawns and potatoes steamed in the natural H20 or even just straight-up sippin’ on some hot (and a wee bit salty) hot spring water, in Beppu, this is living. I drank scalding liquid from the devil’s mouth, as pictured below, in the form of free onsen water to taste! A really unique experience. Sporadically throughout the city are free municipal onsen and ashiyu (foot baths, pictured below), and you would be a fool not to dip in. 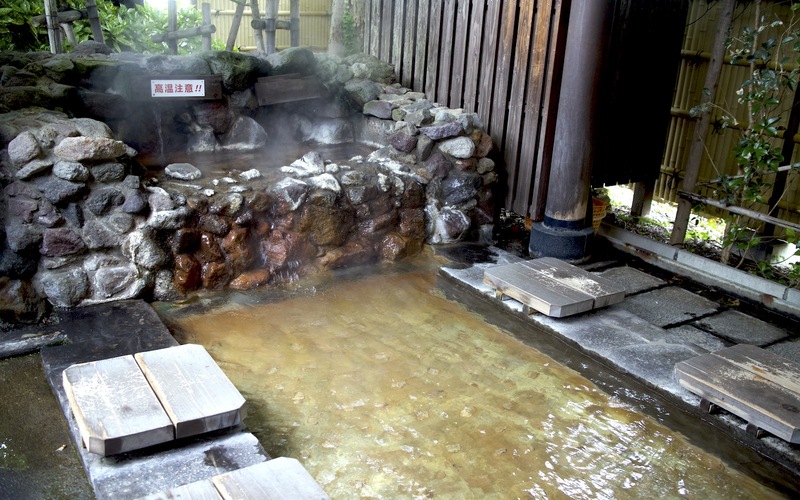 Beppu has more than 15 onsen. Not all are free (like this one), but nearly 10 of them are tattoo-friendly! 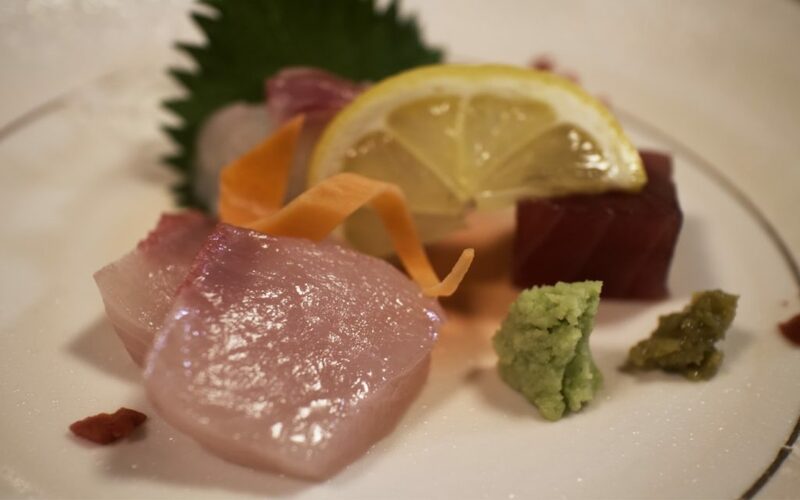 Yet looking beyond some of the main tourist stops brings us to elegant places like Hyakuzaen no Yume, with a view to die for and sushi and sake that won’t disappoint. (You can make a reservation here. (Japanese)). Despite the fascinating structures from the Genroku period and beyond comparison sweet-yet-subtle sake ice cream (not soft cream), Mameda’s people bring its charm to peak level. 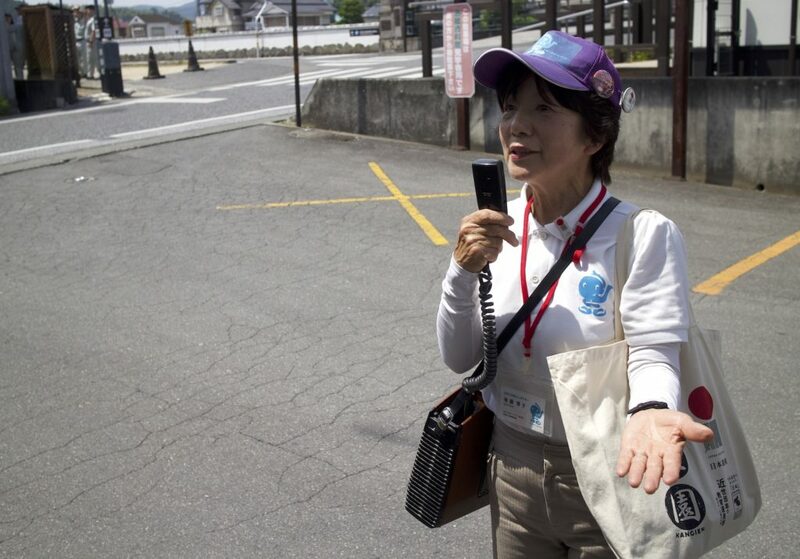 Tour guide Hiroko Goto is bonkers for this little town, even though her hometown is Osaka. She moved her because she loved it that much. Goto’s enthusiastic advice while in Mameda? Tour with the five senses in mind. 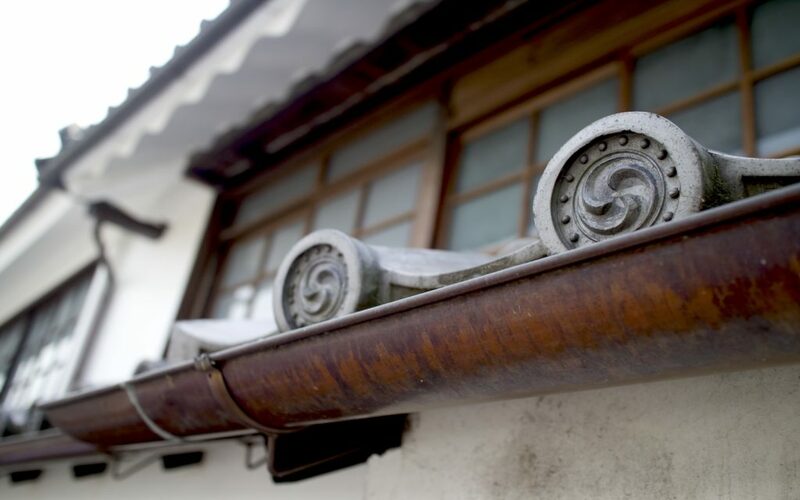 Look up, down and all around at each detail while you stroll down the main street Mameta-cho. And, so, I did. It’s not yakitori, but senbei (Japanese rice cracker) sold as street food. 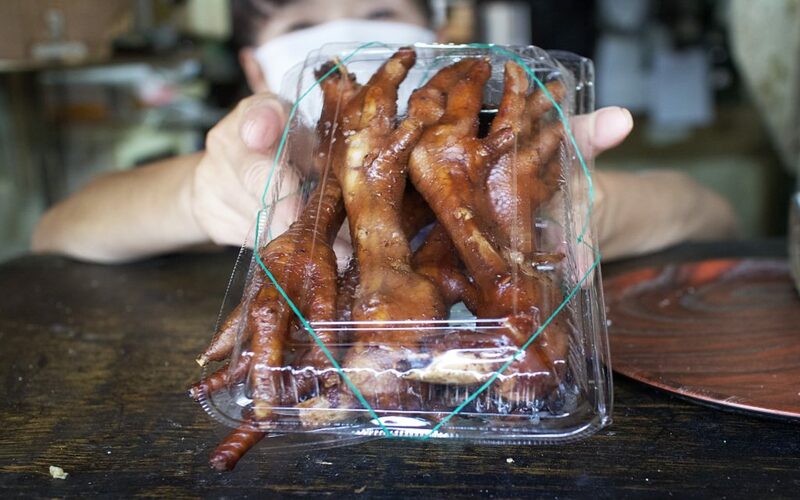 Chicken feet! 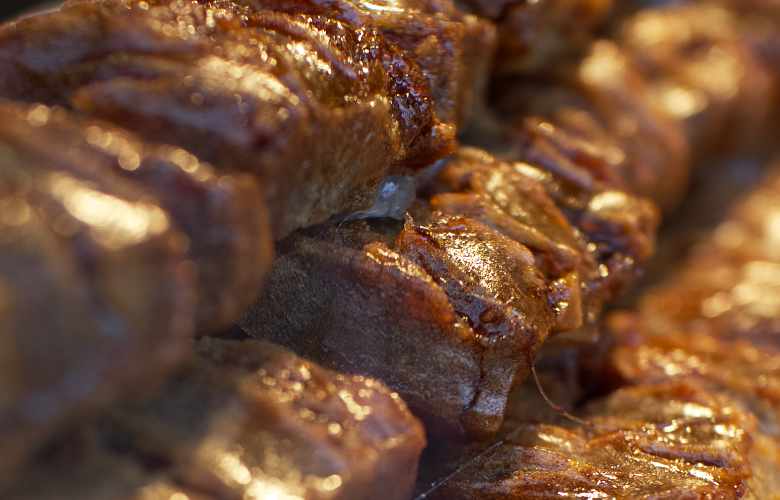 Also sold as street food to-go! And along the way, we met a few shop owners who embodied the character of the area. This gent showed us how to catch eel the old-school way with the eel traps he is selling (as seen behind him) and posed for this picture. 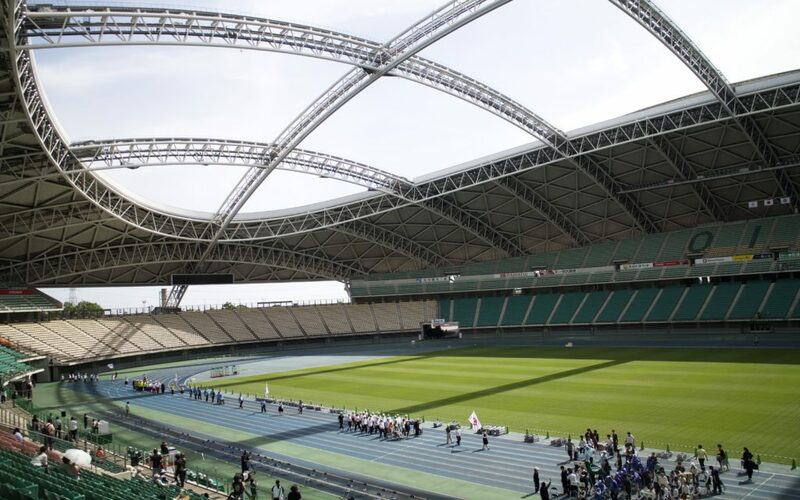 Oita will be one of the hosts of the 2019 Rugby World Cup games. Aesthetically, it’s a pretty cool stadium, but after a quick jaunt here, I was ready to dig into more history — a lot more history. 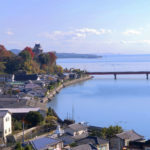 Hilariously referred to by the historian and chief manager of the Usa Tourism Association, Tatsuhiro Ono, as the “U.S.A. of Japan,” Usa City’s Usa Shrine is a gem for history lovers. It’s packed with brilliant bits of Japan’s rocky past that our tour guide told us most Japanese people aren’t even familiar with. The huge establishment the size of 130 Tokyo Domes is the head shrine amongst thousands in Japan that honors the god of war and archery. Seen above is an impressive roofed (can you see it?) 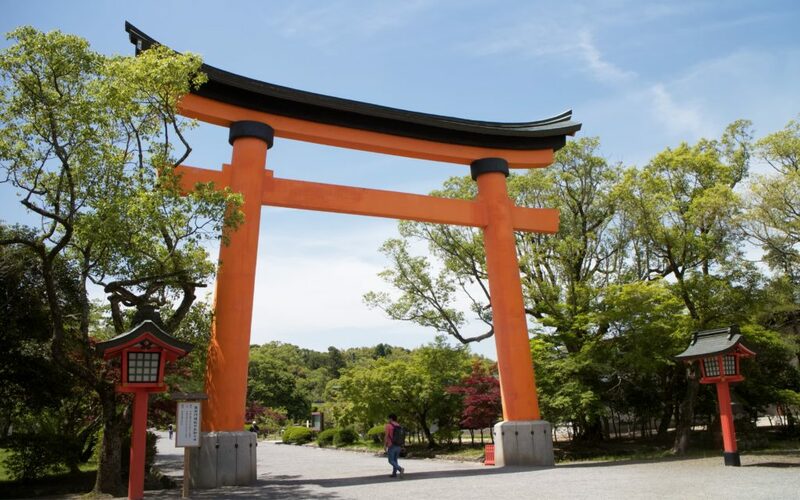 torii gate that (fun fact!) was actually part of an Audi calendar. 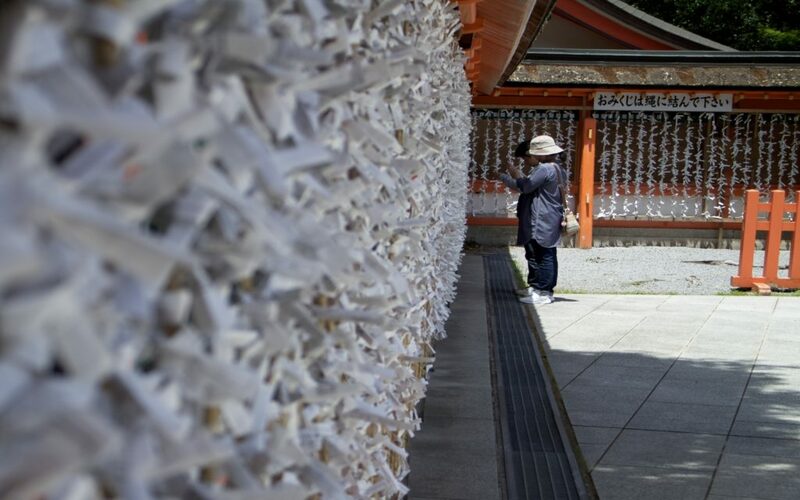 The area is a must-see when in Oita, and I wish I would have had a few days to discover the surrounding sub-shrines and nature. I’ll keep it brief, but to hear more of its riveting history read this fantastic piece on the history of this shrine later. 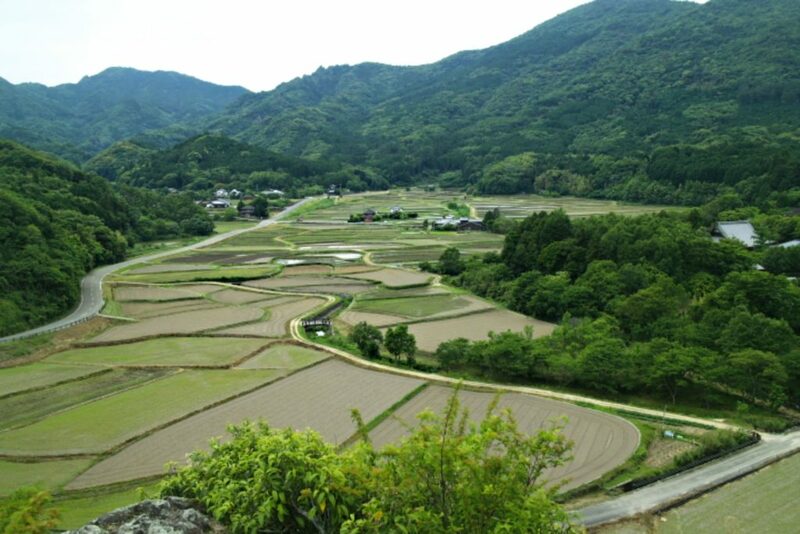 Considered an “important cultural landscape” in Japan, this uniquely shaped rice field is just plain mesmerizing and the locals who tend the land are quite proud. 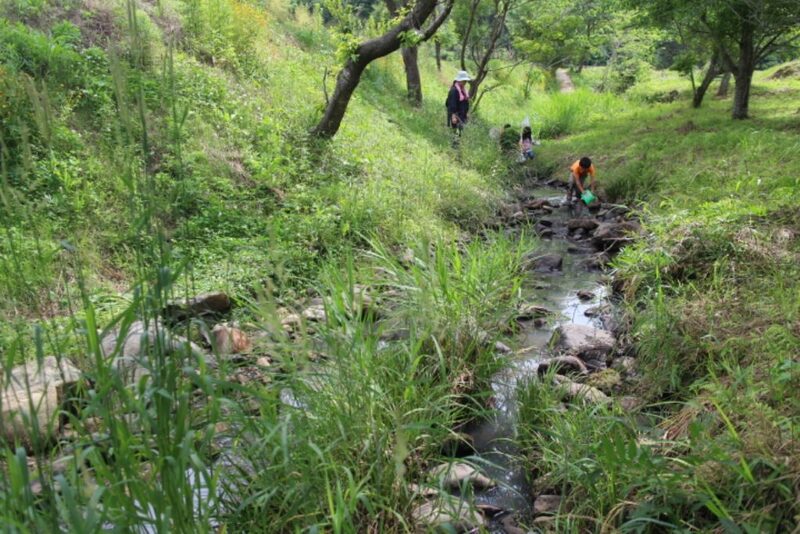 What’s more, I learned the area an hour north of Beppu by car encompasses 54 types of dragon flies from our guide Koji. 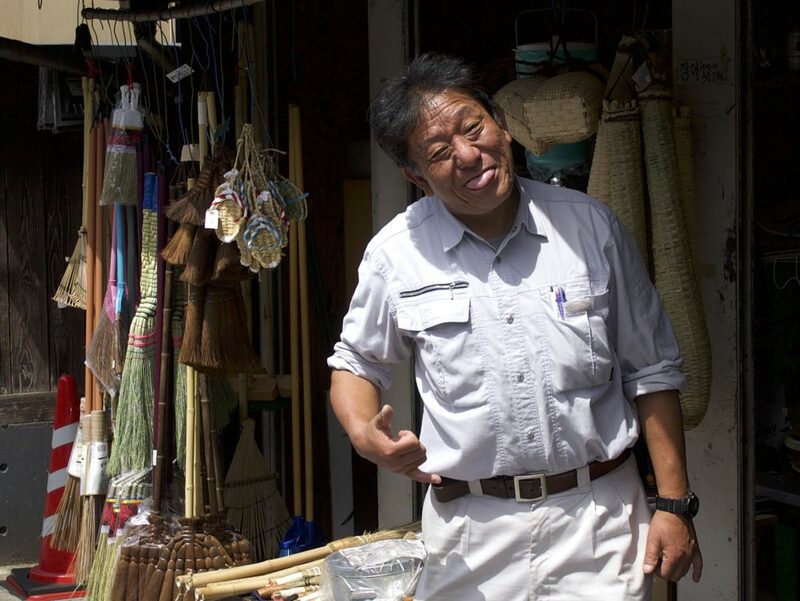 Koji was living near Tokyo but moved here to raise his kids in the simple life. Follow this sign (below) and the path to get up to the viewpoint for the best view of it. For this view (which is even better in summer), hit up the observation deck here. This is probably the closest you’ll get to literal heaven on earth. 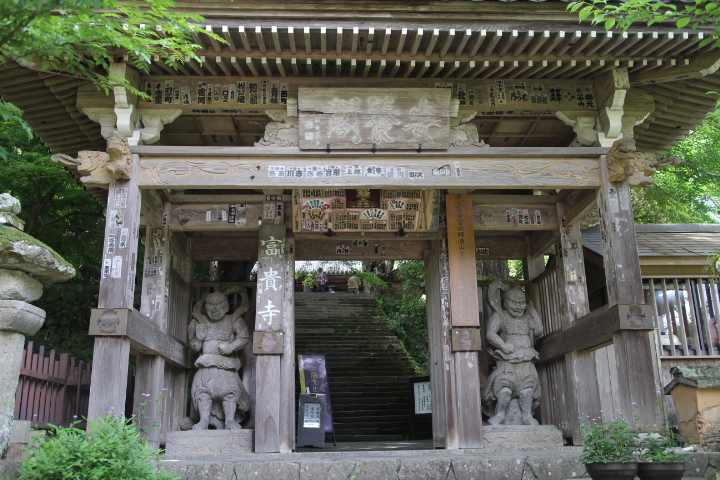 Hiding in the forest, you’ll find this 900-year-old unchanged temple that’s the oldest wooden building in Kyushu. 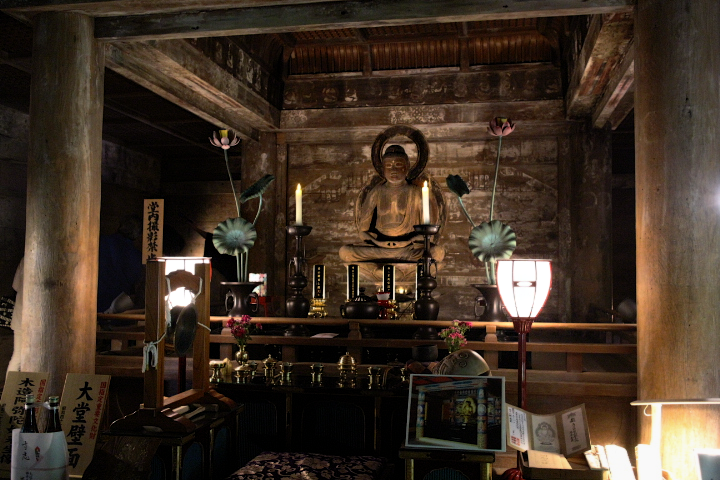 Fuki-ji Temple holds a sacred wooden Buddha and if you look close enough, you’ll discover more than 500 painted Buddhas (now faded) all along the walls of the interior. 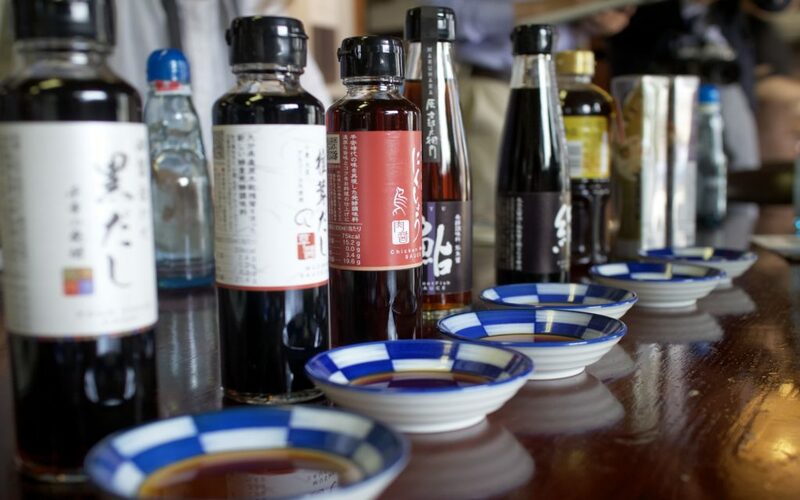 Stick around a while to explore and after, buy some omiyage or try the cute coffee shop nearby. So… what did I find? Change and innovation cannot be led in isolation. It dawned on me that, that’s really what this trip was about. 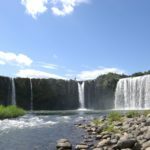 Travel is a chance to help alleviate the isolation between foreigners and Japanese with the expectation not to fully understand each other, but to gain an understanding of a small segment of each other’s worlds. The people of Oita were so gracious and willing to share every bit of their culture, and yeah, a lot of it was minutia and not really what I would be typically interested if it were my first time in Japan. 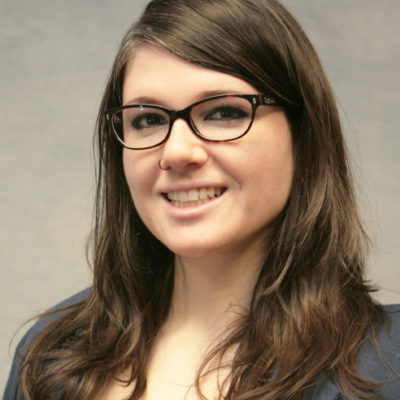 But it really made me think: If we are here to experience the culture (which is what 90 percent of tourists say is their goal), what better way than to get to know some part of Japan through the eyes of the people who live there, rather than just seeing as much as you can through your own? You can start planning your own Japan trip on GaijinPot Travel.